The Merced County Public Library, rural and small, seeks to be an integral part of its community by providing all residents with a balanced range of resources and activities, meeting educational, cultural, and recreational needs. The Library serves as the center for lifetime learning and enjoyment. A knowledgeable Library staff provides high-quality reader's guidance and research and assistance using local resources and interlibrary materials and services. The friendly environment of the facility promotes maximum resource utilization. Serving you with over three million...Books, DVDs, audio books, downloadable books, music CDs, software and video games available! Valley Cat is the online catalog used by all the libraries which are members of the San Joaquin Valley Library System. These libraries include Merced County Library, Fresno County Library, Coalinga Huron Library District, Kings County Library, Kern County Library, Madera County Library, Mariposa County Library, Porterville Public Library and Tulare County Library. When you have a library card at one the San Joaquin Valley libraries, you are entitled to borrow materials from any of the libraries in the San Joaquin Valley Library System, or SJVLS. Merced County Library card holders may check out up to 25 items on their cards and request up to 30 items from the libraries in the SJVLS. This means access to over 3 million total items. Borrowers may access their library card accounts from Valley Cat and see the titles and number of items checked out, view the status of their requests, see if they owe any fines and renew their items, using their library card numbers, which are found on the front of their cards. Each borrower also has a four digit personal identification number, or PIN which is needed to access an account. Borrowers are encouraged to select a PIN that is easy to remember. The same PIN may be used by all members of a household if desired. The PIN is chosen by the borrower at the time of creating the account. PINS may not be changed online. 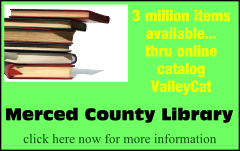 The Valley Cat online catalog can be accessed from your own computer by going to http://www.mercedcountylibrary.org and then scrolling down and clicking on Online Catalog. You may search Valley Cat without logging into your account, but if you log in, you are ready to automatically request items and create a list of titles for future reference, sort of like a wish list. Books, DVDs, audio books, downloadable books, music CDs, playaways, software and video games are available through Valley Cat. There are seven databases available for use as well as a newspaper index through Valley Cat. The databases are: Ancestry, Chilton’s, Infotrac, Learning Express, Newsbank and Reference USA. If you are accessing these databases from home, you will be asked to log in with your library card and PIN number. Sometimes a borrower searches Valley Cat from home and finds what seems to be the perfect item needed for his or her project, sees that it is checked in, writes down the title, call number or letters and rushes to the library to pick it up, only to discover that it does not belong to a Merced County library, but perhaps to a library in Fresno County. There is a way to isolate your search so that you only find items in Valley Cat that belong to a certain library. Once you are on Valley Cat’s site, click on Search, then Keywords with Limits. Enter your search term, then select your choice of location in the box below. More questions? Please contact the library at 209-385-7643. We are here to help!